Though he admits that he admires Kim Chiu, Jolo Revilla would rather focus on work instead. 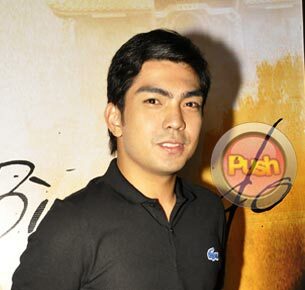 Jolo Revilla has many reasons to be excited about his upcoming teleserye My Binondo Girl. Apart from being a primetime soap opera, he will also be the leading man of Kim Chiu, on whom he has a crush. “Una sa lahat, nagpapasalamat ako sa ABS-CBN dahil after Pepeng Agimat nag-Noah tapos nag-Kapitan Inggo, tapos heto na naman, My Binondo Girl na naman. Kumbaga, tuluy-tuloy ang mga project na ibinibigay nila sa akin so nagpapasalamat tayo sa suportang ibinibigay nila,” Jolo answered when asked about how he feels about his new project. The actor-politician also has good words about leading lady. “Masarap pala siyang katrabaho, hindi mabigat. Kumbaga maayos naman, masaya,” he described Kim. Aside from Jolo, Kim’s other leading men are Matteo Guidicelli and Xian Lim. Jolo said that he also continues to remain friends with former girlfriend Grace Adriano (Rosanna Roces’s daughter) with whom Jolo has a son, Gabriel. Jolo said that his son is currently with him but also spends time with his mom. Though he is busy with showbiz and politics, the young actor also revealed that he is down to his last two terms before he can finally graduate with a marketing management course.